Well on its way to becoming the most influential tech company in Canada, Shopify is growing – and growing fast. The e-commerce platform company just opened its second Toronto office, Shopify R&D located in the city’s downtown, a short walk from its primary headquarters in the commerce capital of the country (their main HQ for the company overall is in Ottawa). 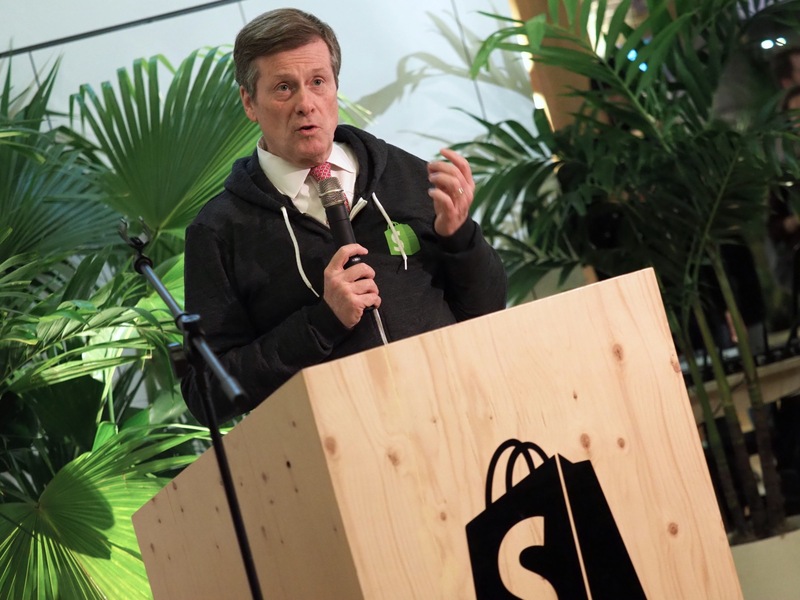 Toronto Mayor John Tory attended the opening, hailing the city as one that “welcomes disruption,” and praising Shopify as a key ingredient in terms of attracting and keeping talent to the area. Shopify’s new digs are very similar to its existing space in the city, with high ceilings, huge wooden beams and communal work spaces. Shopify has intentionally drawn on the example of Google in developing its internal culture, and it shows in its approach to office design, with free catered lunches, in-house activities and plenty of employee-focused events. Floors blend into one another, including with a wide, shallow staircase that doubles as stadium-style seating for town halls and other meetings. Toronto Mayor John Tory at Shopify’s new expansion office opening. This was where Mayor Tory spoke to an audience of a hundred or so Shopify employees, media and guests. 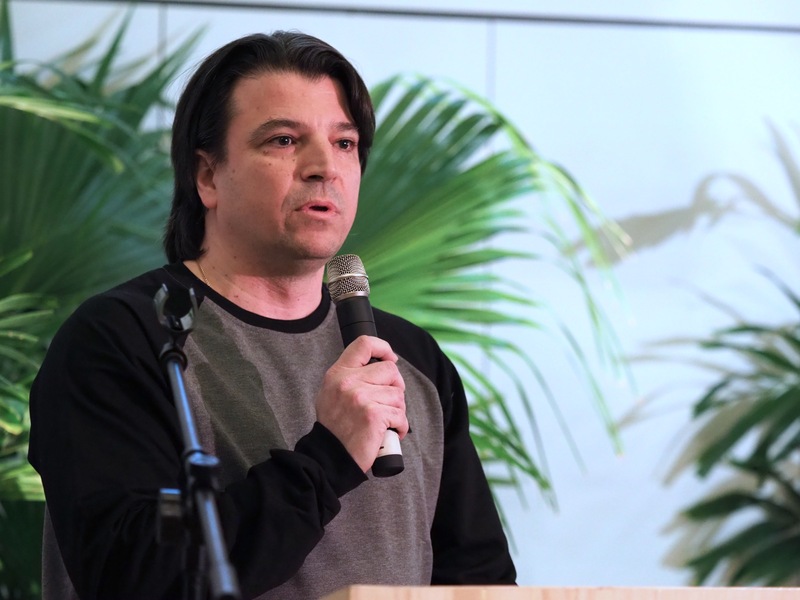 Presenters also included a small group of Shopify’s leadership team, including Chief Marketing Officer Craig Miller; VP of Product Satish Kanwar; Director of Engineering Stergios Anastasiadis; and Director of UX Monika Piotrowicz, all of whom fit the profile of the relatively youthful executive also exemplified by Google’s work culture matrix. Shopify’s ambitions are Google-sized, too – at the event, the company announced a total size of 300 employees right now in Toronto (there over 1,750 employees worldwide), with a goal of hosting 200 at its new R&D office, and plans to scale the team up to 1,000 members in the city by 2019, by which time it’s hoping to expand to a brand new office location that will bring the teams back together under one roof a little further West in Toronto’s downtown metro area. The new R&D office itself is already on track to be full, and is curiously named, because it’s not strictly a skunkworks or secret lab as you might expect. Instead, it’s a home for a large portion of Shopify’s user experience (UX) design team, as well as a big chunk of its engineering talent. Shopify Garage also calls the place home (though there’s a Garage works in every Shopify office, too), which is where the company develops experimental products with leaner, more startup-like sprints, including Frenzy, its flash sales mobile app. But it’s more about bringing together two core aspects of the organization that work in close cross-functional partnership, according to Piotrowicz and Anastasiadis, who I spoke with following the prepared remarks. Piotrowicz also discussed how Shopify takes a holistic view to UX, applying it organizationally as a function that is both internal and external facing, and a key partner to engineering when it comes to product design. Anastasiadis also echoed this sentiment, though he did say that design and UX often lead at Shopify when it comes to product development, which echoes Apple’s approach to building things. 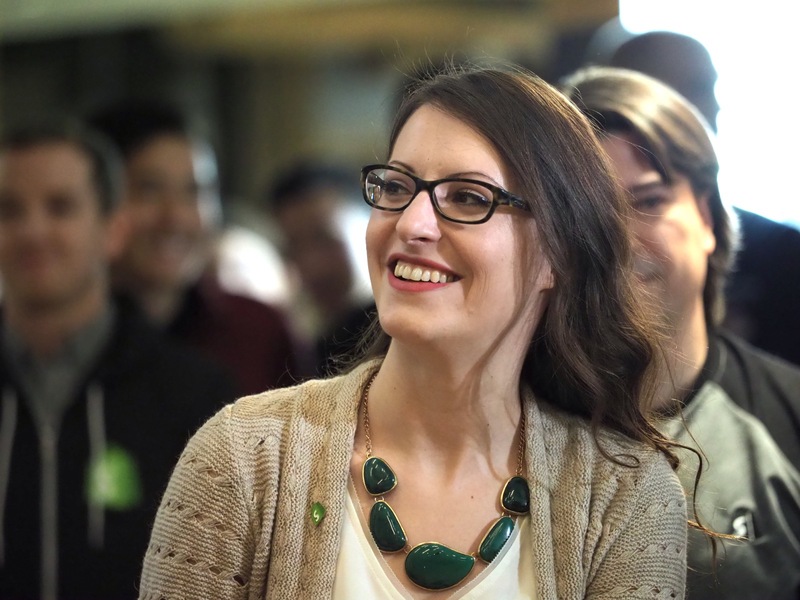 Both Piotrowicz and Anastasiadis agreed that product ideas at Shopify are sourced from a variety of places, including both UX and engineering, as well as use feedback. The new office should help focus the development and growth of those ideas – as well as help mature existing R&D experiments like Frenzy, which Anastasiadis told me Shopify will be taking “to the next level” soon through additional product development after the Garage experiment proved successful with users. The new facility will also house experiments in hardware R&D, for which pursuits Shopify is hiring. Shopify already creates retail hardware for merchant use in-store, but both Piotrowicz and Anastasiadis acknowledged that there’s still lots of opportunity to update in-store retail from a hardware perspective, and lessons to be learned from companies that are looking at ways to more closely integrate software platforms and commerce’s more physical trappings, including Apple and Amazon. Shopify has big ambitions that extend well beyond its core goal of building an online selling platform for merchants of all sizes, and its growth in Toronto reflect its success in pursuing those goals. The big question remains whether it can translate its core business achievements into a broader mandate that can help it grow into those Google and Apple boots its using as its aspirational models. Tapping into Toronto’s growing pool of tech talent is a smart place to start.